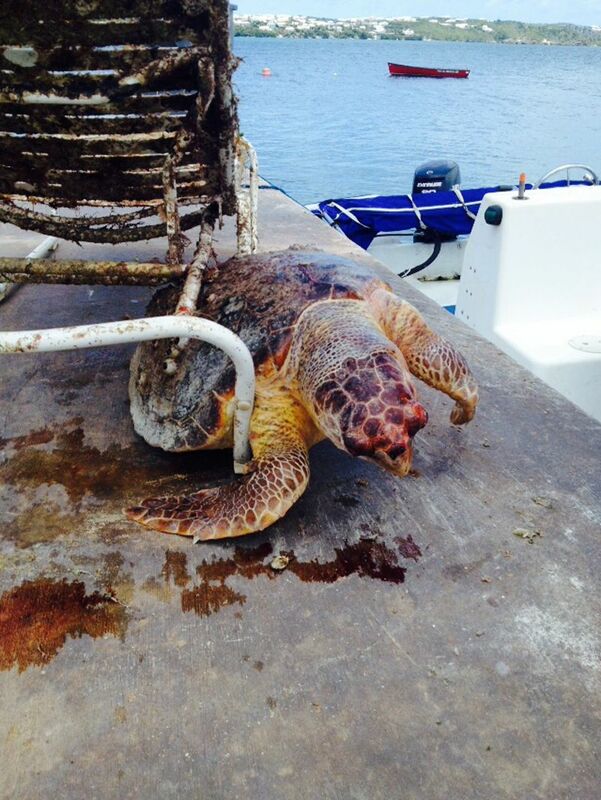 Residents are being urged not to throw debris into the ocean after another sea turtle was found dead recently. 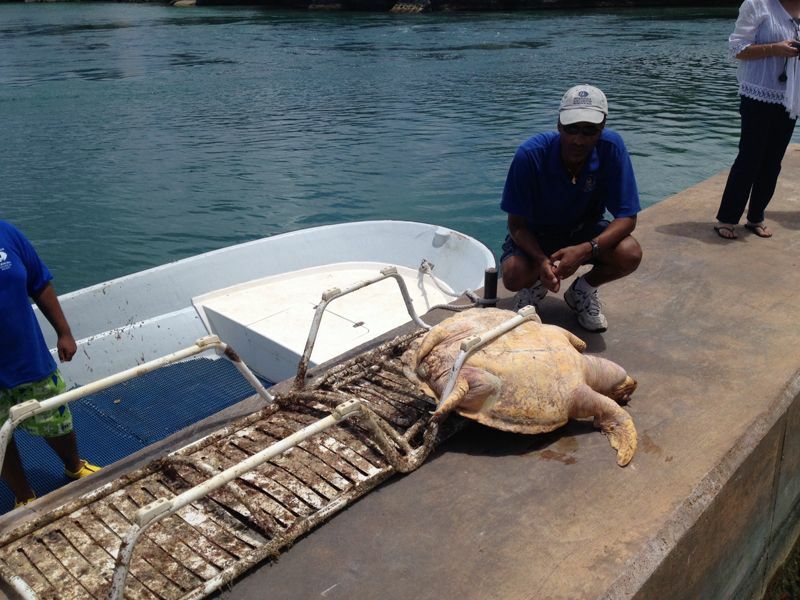 Two swimmers near the channel off of Dockyard recently found a turtle floating dead in the water. The animal had become entangled in fishing line and strangled to death. At the end of June, four boys—Kaiser Dill, Dajae Doars, Sylas Young and Cory Basden found a dead sea turtle that drowned after getting stuck in a lawn chair. The boys found the turtle was found off of Harbour Road and alerted The Bermuda Aquarium, Museum and Zoo. Curator Patrick Talbot responded to their call and had to use a hacksaw to cut the sea turtle loose from the chair. On average, the BAMZ gets 40 turtles a year who are either injured or dead. Man is responsible for up to 33% of those turtles in any given year. She added it is very important for people fishing off of Bermuda’s shores not to leave broken line in the water, which can ensnare not only sea life, but birds as well. Ms. Gray said if anyone does find a dead turtle they should let the Aquarium know. Mr. Talbot gave praise to the four boys who found the turtle and were alert enough to call the Aquarium. He also called on people not to just toss their fishing line into the ocean. He said items like lawn chairs are more challenging but stressed the need for people to secure outdoor items during stormy weather. 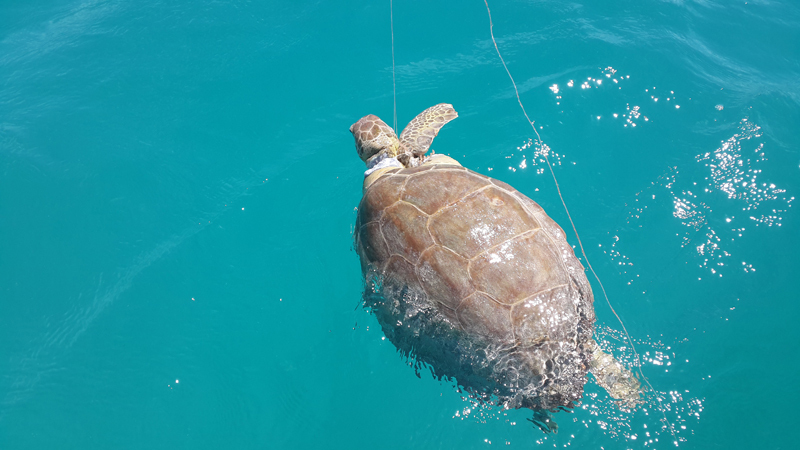 Mr. Talbot said it is the second time he is aware that a sea turtle had become trapped in a lawn chair in Bermuda waters and drowned. This is really sad to read. Something needs to be done about this to hold people accountable. First of all we need to enforce our existing laws better and fine people for fishing in illegal spots such as bridges. Then we shouldn’t allow anyone to fish without a fishing license. Yes, I think that time has come because people seem to have no regard for our land or sea life. And corrupt political leaders are destroying people worldwide. Regulation doesn’t criminalize people – their own actions criminalize them. Regulation simply provides reasonable guidelines where self-governance has failed. What rights do you have to fish? ‘Rights’ defined by a sense of entitlement? You currently enjoy the privilege of being able to fish. What if the licences were free? No fee attached. In the interests of responsible conservation of the limited resources being consumed by a growing population, do you not think people enjoying the privilege of fishing should be held accountable by way of regulation? Self governance (in absence of regulation or guidelines) is clearly failing. will we ever learn? will we ever have a conscience? will we ever truly care for others? I do not think that chair was thrown in it looks to be in very good condition. It was most likely put there from the hurricane. which leads to the importance of securing your item Before a storm hits. it not only can damage cars and house but can also end-up in the sea and damage sea life. This just infuriates me, I don’t think the point would have been made if those photos were not shown – even though they are so hard to look at. We take our home for granted and the amazing life that surrounds us. Get it together Bermuda – before we are our own demise. It is sad, but what’s REALLY sad is we have a louder outcry for animals then we do for our fellow men. Want to see a mess of tangled fishing line? Snorkel around the point of 9 beaches off the rocks where people fish. Disgusting. Not only is it dangerous to sealife it is dangerous to snorkelers as it is a popular area with visitors. At one point there were many fish in the area. Now, not so much. Fished out by people who have no concern for anyone or anything but themselves. I agree, and there are those of a certain nationality that fish all over the island catching SMALL fish. It’s really tragic. Turtles are a valuable part of our ecosystem and we must all be vigilant to protect these wonderful animals. Nothing prangs my prop more than seeing terrible images such as these. How the chair ended up in the ocean is subject to speculation but responsible Mariners should do their part and collect trash from our beautiful oceans. It takes a real champ to pick up after others. Kudos to Commodore JB of BBIRYC who has partnered with local and overseas groups to revamp the turtle conservation program here. People must appreciate that turtles are our friends- sharks and dolphins not so much. Nothing wrong with sharks and dolphins.